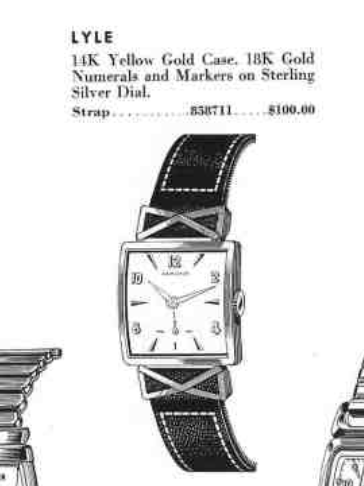 Watches in the mid-1950's had some very interesting designs. I suppose the same is true with cars, if you think about it. Although there were plenty of the usual stalwart designs, there were also some very unique models. One of them was the Lyle, introduced in 1955. It had what appears to be "hidden lugs" that are actually open. So you can can see the strap beneath what looks like a bow. The Lyle came in a solid 14K yellow gold case. In 1955 the movement in the Lyle was the 8/0 sized 747 movement with 17 jewels. 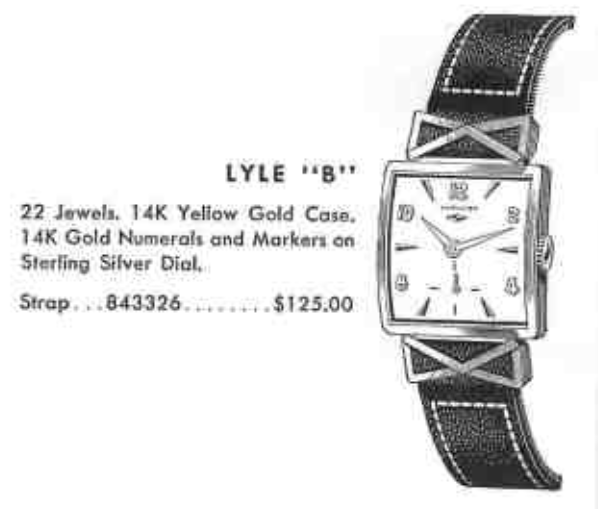 In 1956 the movement was changed to the 22 jewel 12/0 sized 770 and the since the case had to be changed to accommodate the different shaped movement, the model name was changed to Lyle B. The price also went up by 25%. The Lyle B was also produced in 1957 so there are probably more Lyle B's out there than Lyles. I don't think you come across the Lyle that often. I've seen a couple for sale over a few years, at least that I can recall. Perhaps it wasn't very popular relative to similarly priced models with more traditional masculine designs. One way to tell the Lyle from the Lyle B is the Lyle B will have a diamond shaped marker on the dial under the Hamilton logo. The Lyle does not have that marker. I did recently come across one for sale but it was a bit on the ugly side, starting with what is arguably the world's worst choice of crowns. The back of the case is engraved with a presentation from Marshal County Teachers... a very nice remembrance, I am sure. The dial on my project watch has lost it's finish. I don't know if it's over cleaned, as the printing is still there but regardless, the dial looks pretty cruddy. If there was any doubt about the model's ID, the name is engraved in the case back. That's not always the case (pun intended) but it was a fairly common practice in the 1950's. It's been quite a while since this watch has been to a watchmaker for a cleaning but it appears to be in good shape. The first thing off the movement are the balance jewels. Then the movement is completely stripped of parts. While everything is in the ultrasonic being cleaned, I will prep a new crystal for installation. I forgot to take my usual photo of all the parts laid out but here's a photo of the mostly reassembled movement waiting for it's winding and ratchet wheels and then balance. The movement is now looking bright and shiny. It also is ticking away with a nice motion. Just a slight tweak to the regulator to slow the beat rate down is needed. Otherwise the performance looks great. Replacing the crown will be a piece of cake, thanks to a stash of crowns I recently picked up. You often see these boxes for sale but they usually are empty of parts. This one still has lots of crowns but just dress crowns, there are no waterproof crowns in the kit. Fortunately the Lyle B uses a dust proof dress crown. A quick refinish thanks to my friends at International Dial Co. and this reassembled and restored Lyle B is looking and running fantastic. I'd say a new crown, fresh crystal and correct dial refinish made all the difference in the world... don't you think? HI Dan, looks great! The lug design is a familiar motif from the '50s, most often found in kitchen appliances, at least from my experience. Question: how are you polishing your cases? Beauiful work as always. I’m very careful with polishing cases, especially solid gold ones, as it’s easy to round over sharp edges. I use simichrome polish and a soft buffing wheel. Then I thoroughly clean the case in my used cleaning solution. They typically come out great.